Despite the recession and years of budget cuts, California schools overall haven't lost any ground in getting students to graduation day, according to 2012 statistics released Tuesday. In fact, state high schools saw across-the-board improvement in graduation rates, with African American and Hispanic students posting the largest gains. On average, 78.5 percent of students in the class of 2012 graduated on time, up 1.4 percentage points from the year before. African American and Hispanic students continued to lag behind the state average, but closed the gap. In 2012, 65.7 percent of black students graduated with their class, up 2.9 percentage points, while 73.2 percent of Hispanic students graduated on time, up 1.8 percentage points. "Nearly 8 out of 10 students who started high school in 2008 as the Great Recession hit our nation graduated in 2012," said Dean Vogel, president of the California Teachers Association in a statement. "Imagine how much better these graduation numbers would be if the state had not cut or deferred more than $20 billion in education funding in recent years." In San Francisco, district officials celebrated statistics showing extraordinary one-year gains among some of the most at-risk students. The African American graduation rate hit 70.8 percent, up 7.2 percentage points from 2011 and a total gain of nearly 14 points in the last two years. 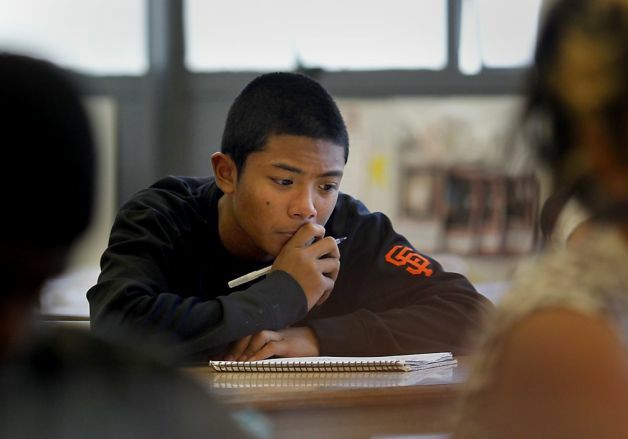 Pacific Islander students posted the biggest gains, with 70.6 percent graduating, up more than 10 percentage points. The graduation rate for Latino students stayed about the same. "While we still have too many youth who are dropping out, I want to acknowledge all of the parents, teachers, counselors and principals who helped many youth persist and reach this important milestone of high school graduation," said San Francisco Superintendent Richard Carranza. Dropout rates declined, with more students continuing their education even if they didn't graduate on time, according to state and local data. Not all districts had cause to celebrate, though. Oakland's dropout and graduation rates, for example, were relatively stagnant. San Francisco officials said a variety of efforts at city high schools have led to the higher graduation rates. At Burton High, administrators have increased support for freshmen to make sure they can handle the academic and social pressures of high school. In addition, all district high schools have adopted a system that uses a list of early warning signs - chronic absenteeism, suspension and other behaviors - to identify and help individuals at risk of dropping out. At Burton, it's paid off with a graduation rate of 87.9 percent in 2012, up more than 10 points in one year, despite the significant cuts to the school's budget over the last few years. While schools might not see any long-term effects of the recession for a while because of the time it takes for students to move through the system, the numbers released Tuesday indicate that the dire predictions of dismal failure caused by education budget cuts have not panned out. "I think we did a very good job of focusing cuts where they would do the least damage," said Rachel Norton, San Francisco school board president. "When you realize what we've been through, I think people have really stepped up, but they're tired. Without an influx of resources, I don't know how long this can be maintained." Norton said the district could see a dramatic drop in two years, given that graduation requirements for the class of 2014 include the more demanding college prep courses required to enter California universities. "We have agreed that we want to bring these students up to a higher level," she said. "I don't want to be yahooing too much about these (2012) numbers because I know what's coming." For more state or local data on graduation and dropout rates, go to dq.cde.ca.gov/dataquest/.